This article is about the fictional show. For the character, see Count Cannoli. Count Cannoli as the Silver Zephyr. The Silver Zephyr is a television show that appears in Wario: Master of Disguise about a great thief. Count Cannoli (known as the Silver Zephyr in the series) was the star of the show, until Wario used the Telmet to go into his television and become the star. Each level in the game represents a different episode in the TV series, starting with the first episode. 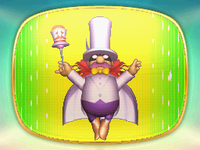 The songs during the show are taken from the game; the main one is Cannoli's theme, and the one where he looks at the S.S. Caviar is Carpaccio's and the transformation's song is from when Wario's wish is "granted". This page was last edited on February 16, 2018, at 04:41.